True or false: Puerto Rico and Guam would be states now if the total number of existing states in the U.S. actually added up to 48. Rarely have I been retweeted more than I was Tuesday when I passed along this link to The Wire wind-up toys. Don Mattingly confirmed to Eric Stephen of True Blue L.A. that he has no plans to bat A.J. Ellis second, citing his lack of speed in front of Matt Kemp. Unfortunately, the alternative candidates’ lack of on-base percentage in front of Kemp seems not to have entered into Mattingly’s thinking. 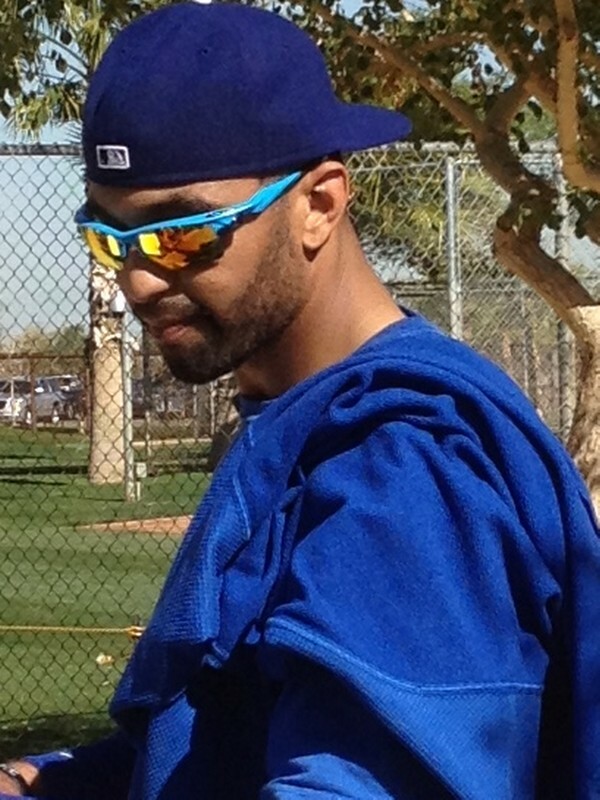 Mattingly also hinted that Juan Rivera would start 2012 as the Dodgers’ regular left fielder with occasional days off. Tony Jackson of ESPNLosAngeles.com added that Jerry Sands is still in the mix to be a platoon partner for Andre Ethier and James Loney. Dodger relief prospect Shawn Tolleson was interviewed by John Parker of MiLB.com. The Dodgers have the National League’s second-easiest early season schedule, according to Buster Olney of ESPN.com. Nine of their first 34 games are against teams with winning records in 2011. Here’s the full list, 200-deep, of Dodger prospect rankings from Brandon Lennox at True Blue L.A. Henry Heredia, this is your moment. Gold Glove or not, Andre Ethier’s ranking in David Pinto’s PMR list for right fielders at Baseball Musings probably won’t surprise you. Matt Kemp in center field? You tell me what you think. Trayvon Robinson is trying to reestablish himself after his hot start with Seattle turned into a rough finish, writes Larry Stone of the Seattle Times. 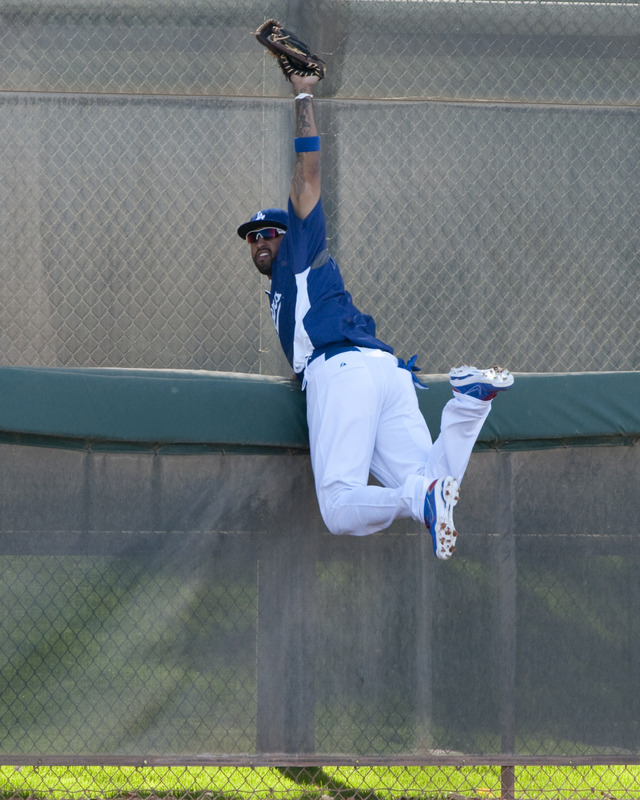 Tuesday in Jon SooHoo: two pics that fostered polar opposite reactions for me, Jerry Sands bunting and Matt Kemp skywalking. Not surprisingly, initial reaction to the new book from Dirk Hayhurst, Out of My League, is positive. Examples: Andrew T. Fisher of Purple Row and Keith Olbermann at Baseball Nerd. The statement from Ryan Braun sample-taker Dino Laurenzi is eloquently written. Coming March 15-17 is a SABR Analytics conference in Arizona. 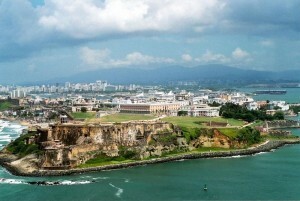 Not coming at the same time is the Notalytics Conference in South Dakota, but I sure wish it were. Emmett Ashford, the majors’ first African-American umpire, was given an honorary doctorate by his alma mater, Chapman College, according to Terry Cannon of the Baseball Reliquary. Giancarlo Stanton: the slugger formerly known as Mike Stanton. Harvard-Westlake’s Lucas Giolito hit 100 miles per hour while pitching a one-hitter for the Wolverines on Tuesday, writes Eric Sondhiemer of the Times. Perfect for Leap Day: The Dodgers had the 29th-best offseason of all major-league teams, according to The Platoon Advantage. KCRW’s Which Way L.A. now has its own blog. Jonathan Abrams and Grantland published a vivid oral history of the 2004 Pacers-Pistons fight that spread into the stands. Longtime Times columnist Steve Harvey is back writing “Only in L.A.,” host Kevin Roderick of L.A. Observed announced. The first new edition is here. Watch former Cal quarterback Joe Ayoob break a world-distance record for throwing a paper airplane at ESPN.com. I’m proud to be one of the contributors to the upcoming ebook, The Hall of Very Good, edited by Sky Kalkman and Marc Normandin. 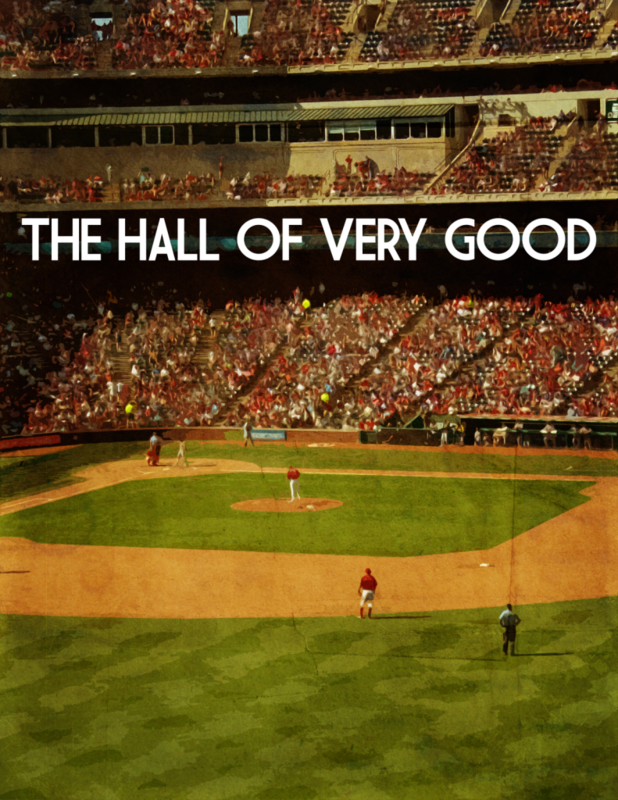 The Hall of Very Good is an ebook meant to celebrate the careers of those who are not celebrated. It’s not a book meant to reopen arguments about who does and does not deserve Hall of Fame enshrinement; rather, it’s meant to remember those who, failing entrance into Cooperstown, will unfairly be lost to history. It’s for the players we grew up rooting for, the ones whose best years led to flags and memories that will fly together forever. Players like Bret Saberhagen, Will Clark, Dwight Evans, Tim Salmon, Wilbur Wood, Orel Hershiser, and literally hundreds of others. This is not a numbers-driven project (although our contributors lean analytical in their views). Our plan isn’t to be overbearing with numbers and spreadsheets to convince you that these players are worth remembering. What we want to do, instead, is accomplish that same task through stories. Think of your favorite players growing up: they have their moments, games, seasons, quirks, personalities, and legends worth remembering and sharing. Now, combine the best of everyone’s forgotten favorites, and you’ve got a Hall of Very Good. Ask the people who have those memories and love for these players to write essays about them, and you have a book on the same topic. The subject of my contribution will be Reggie Smith. (For those who have asked, a Pedro Guerrero opus from me will come another time.) To learn more and to pledge support for this project, please follow this link. If the Dodgers replaced baseball’s 27th-best second baseman offensively with the ninth-best, a lot of us would be doing cartwheels. At least three cartwheels, maybe seven. By that token, maybe we should be doing at least two cartwheels – and as many as 11 – over the fact that, according to David Pinto of Baseball Musings, the Dodgers are replacing baseball’s 27th-best second baseman defensively with the ninth best. He’s in the decline phase of his career, but Mark Ellis should still be a considerable improvement over Jamey Carroll (the aforementioned No. 27), and Aaron Miles, who combined to take 75 percent of the Dodgers’ innings at second base last year. 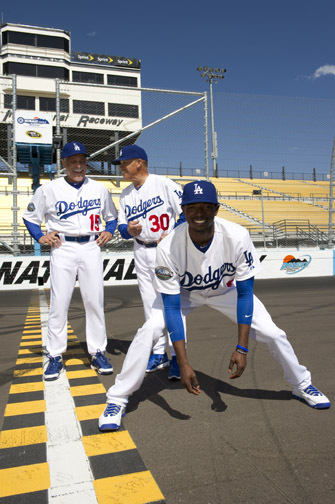 Today in Jon SooHoo: Dee Gordon is off to the races. Dylan Hernandez of the Times chronicles the maturation of Matt Kemp. Former Dodger reliever Danys Baez is retiring, according to Ken Rosenthal of Fox Sports (via MLB Trade Rumors). From 2006, the year the Dodgers acquired him and Lance Carter from Tampa Bay for Edwin Jackson and Chuck Tiffany, Baez had a 5.16 ERA (85 ERA+) in 265 1/3 innings with 154 strikeouts and 396 baserunners allowed. And one balk. Jackson in that time has pitched 1,003 2/3 innings with a 4.38 ERA (99 ERA+), 753 strikeouts and 1,495 baserunners allowed. And five balks. Here’s an interesting story from my Variety colleague Stuart Levine about how the move of “Downton Abbey” and “Luther” from the Emmy miniseries to the Emmy drama category could presage the Emmys nominating 10 programs for top drama in 2013. Meanwhile, I bid farewell to the Oscars with a Variety On the Air blog post calling for Academy to understand, once and for all, that they’re making a TV show, rather than filming a stage show. And that starts with the selection of their next host. 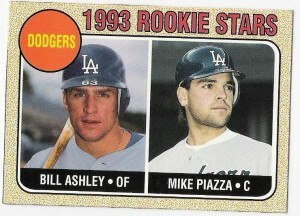 … He didn’t look much like a major league ballplayer 14 years ago, either. That was when Coffey, then a 17-year-old who had just graduated from Forest City High School in North Carolina, was taken by the Cincinnati Reds in the 41st round of baseball’s amateur draft. In those days, when a team maintained exclusive signing rights to all of its draft picks for 11 months, a common practice in the lower rounds was to take players as “draft-and-follows.” That meant drafting a player with no intention of signing him immediately and continuing to scout him as he played junior-college ball the following spring, then making a decision whether to sign him. If the team did sign him, it usually meant he was an “organizational” guy, there to fill out the roster of one minor league affiliate or another, with little to no chance of ever playing in the majors. That was the way DeJon Watson, the Reds scouting director at the time, viewed Coffey. But there also was another draft rule in place then: you had to make at least a nominal, if half-hearted, offer to every player you drafted. So Watson authorized Steve Kring, the Reds’ area scout who had recommended Coffey, to offer Coffey something he was certain the big right-hander would turn down, a $1,000 bonus and an $850 monthly salary in the low minors. Kevin Goldstein of Baseball Prospectus looks at what contracts top youngsters Mike Trout, Matt Moore and Bryce Harper would get if they were free agents. Rafael Furcal was a top-five defensive shortstop last year, according to David Pinto of Baseball Musings and his probabilistic model of range (PMR) stats. … From its very beginnings, the “war” on performance-enhancing drugs in sports, and especially in baseball, has been legally questionable, morally incoherent, and recklessly dependent on collateral damage to make its point. Long ago, I went over to the purely libertarian position on this question simply because any other solution seemed to me to be incompatible with civil liberties and an equitable sharing of power in the workplace — and because every other “war” on drugs that I’d seen had been an enormous waste of time, money, and manpower. Learn how a 1955 San Bernardino gang fight sparked the creation of “West Side Story,” from the Press-Enterprise and the Times. The Los Angeles Dodgers (“LAD” or “the Dodgers”) today stated that the Dodgers and Blackstone have evaluated the bids submitted on February 23rd and have notified the parties that have been selected to advance to the next round. The identities of these parties are being provided to Major League Baseball and they will be meeting with the MLB Ownership Committee, consistent with the agreement between the Dodgers and MLB regarding the sales process. Update: , “Bidders advancing in Dodgers sale: Cohen, Magic/Kasten, Hindery/Barrack, Kushner … and at least two more.” Bill Shaikin tweets. Update 2: “Bidders still in running: Magic/Kasten, Cohen, Hindery/Barrack, Kushner, Kroenke, Disney/Gold, Casden,” Shaikin tweets. Update 3: A blog post from Shaikin with more details. Nope, your eyes didn’t deceive you. 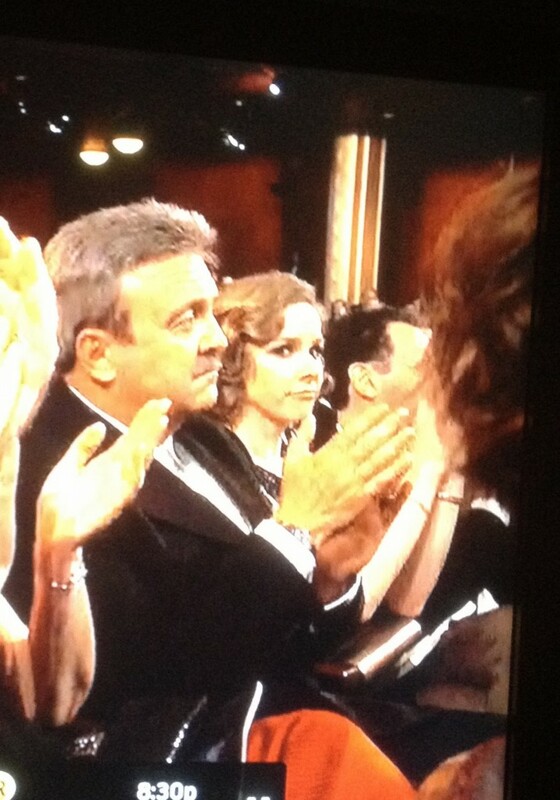 That was Dodger general manager Ned Colletti at tonight’s Oscars. 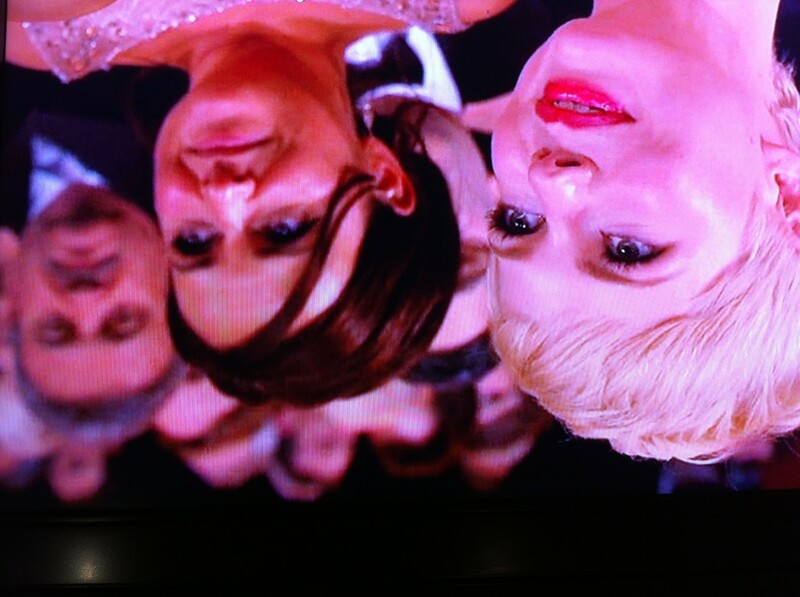 I asked Colletti via text message what brought him to the Oscars. As far as the results, I had few complaints. The Artist was my favorite of the nominated films, and Christopher Plummer’s supporting actor victory filled as best as possible my desire for Ewan MacGregor and Beginners to be recognized. I was a bit surprised that Meryl Streep edged Viola Davis in lead actress, but perhaps voters felt Streep’s 2-14 record in Oscar noms entering the evening was getting a little too Anthony Young-like. The show itself was predictably ragged, incorporating numerous elements that almost seemed designed to turn off both film and television audiences, but the “In Memoriam” approach was the best in recent memory, and the Best Picture montage incorporated one of my favorite soundtrack elements of the year, from Moneyball. My favorite part of the evening, though, was my 9-year-old’s sudden interest in watching the show and seeing her reactions as she took all this in – for better or worse – for the first time. Of the nominated movies, she had only seen Hugo – but that meant she still got to be excited about multiple awards. And she was happy, as was I, that “Man or Muppet” won for best song (out of the ridiculously low two nominees). If anyone around wants to talk Oscars today and tonight, let this be the place. The ceremony’s official start time on ABC is 5:30 p.m. You can also follow all my colleagues at Variety here. From January: My favorite films of 2011. I had hoped to do a big pre-Spring Training piece on Chad Billingsley, but that got lost in the ongoing shuffle of my life. But Tony Jackson of ESPNLosAngeles.com has a good lidlifter on Billingsley, whose mechanics continue to be a work in progress. … After throwing his second bullpen session of spring training last week, Billingsley spent several minutes talking with Dodgers pitching coach Rick Honeycutt, who at one point could be observed manually adjusting Billingsley’s front foot in midair while Billingsley stood frozen at the apex of his delivery. This is what spring training is for, obviously, to iron out little things. But this is a fairly big change for Billingsley, who is trying to stop kicking his front leg out during his delivery — which often results in his body getting ahead of his arm and sometimes allows gravity and momentum to affect his motion — and start keeping that leg underneath his body. And that results in the pitch being off line, maybe no more than an inch or so — but in the big leagues, that can be the difference in a game. Billingsley is hoping this adjustment will allow him to stay on line more often, giving him a little more margin for error with the rest of his delivery because his timing will be right and his momentum won’t cause him to fall off to one side of the mound. One of the more positive assessments of the 2012 Dodgers you’ll see comes from Ben Reiter of SI.com. Steve Soboroff regrets getting on Team McCourt last year, he tells T.J. Simers of the Times, and advises McCourt to sell the Dodger Stadium parking lots with the team. 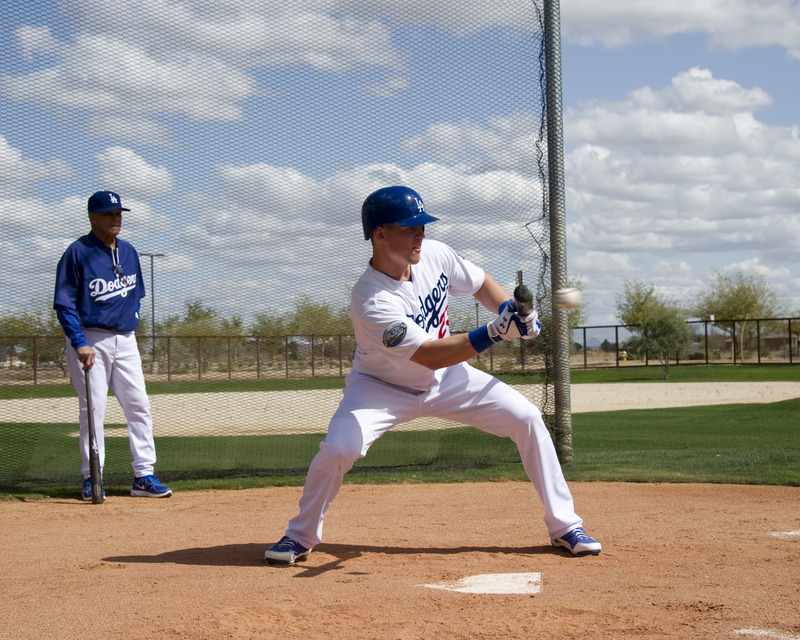 The Dodgers’ annual open tryout at Camelback Ranch is March 1. Potential prospects can call (323) 224-1512 for details and instructions. Eric Stephen of True Blue L.A. ran down a typical day at Spring Training the other day. Jacob Peterson of Beyond the Box Score has an interesting post about extremes involving the ages of baseball Hall of Famers. The departure of Tony LaRussa as Cardinals manager is the only thing that paved the way for Hall of Fame shortstop Ozzie Smith to rekindle his relationship with the team, writes Derrick Goold of the St. Louis Post-Dispatch. Sportsthodoxy offers “Your Handy Ryan Braun Conspiracy Theory Guide” (via Rob McMillin at 6-4-2). If you know in advance that you’re going to limit an ace pitcher to 160 innings in a season, as the Nationals plan to with Stephen Strasburg, how would you do it? David Pinto of Baseball Musings and Tom Tango (in a blog post and the comments below) contemplate the question. An excellent story of how sabermetrics – not to mention FireJoeMorgan.com turned around the career of A’s pitcher Brandon McCarthy is told by Eddie Matz of ESPN the Magazine. 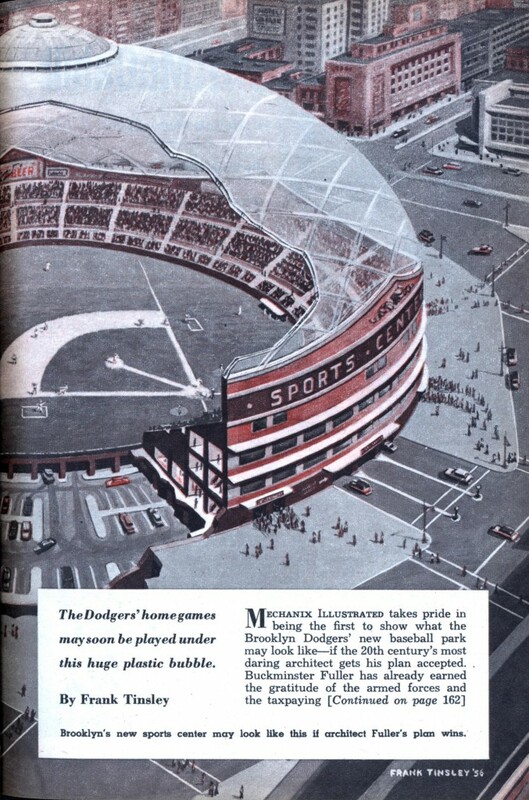 The might-have-been domed new ballpark for the Brooklyn Dodgers and sports center is featured in this four-page story from the July 1956 issue of Mechanix Illustrated (via Baseball Think Factory). Juan Uribe’s 2012 Spring Training is starting off on one good foot … and one wayward foot. Uribe pronounced himself completely healed from his 2011 injuries, but he will miss a few days of Spring Training nonetheless because of the trial of a lawsuit filed by his 2010 San Francisco landlord. We’ll let Tony Jackson of ESPNLosAngeles.com explain. … He has to fly up to San Francisco on Monday, which is the tentative trial date for a lawsuit that has been filed against him by his former landlord stemming from alleged damage to the apartment he rented during the 2010 season while a member of the Giants. The Dodgers are scheduled for their first full-squad workout on Tuesday, meaning there is a strong likelihood Uribe will miss the first workout and possibly a few others while getting this matter resolved. Mattingly, obviously, was a contemporary of Pedro Guerrero. Mattingly also said to Dylan Hernandez of the Times and Ken Gurnick of MLB.com that his goal was to have Uribe play exclusively at third base, rather than move around the diamond, in the hopes of preserving his health. That didn’t stop Mattingly from reminiscing about the time he strayed from first base to become what remains the last left-handed thrower to start at third base. Jackson and Eric Stephen of True Blue L.A. have more. Today in Jon SooHoo: Raul Mondesi and Raul Mondesi Jr., 1995. That little guy, by the way, is now a 19-year-old Brewers minor-leaguer. More thoughts on the Ryan Braun case from Jason Roberts at Fangraphs and Chad Moriyama at his blog. It’s nice to add a weapon to your decision-making, but there’s always the question of how you use it. The signing of Chris Capuano (shown above pitching a two-hit shutout with 13 strikeouts against the Braves last August) has been framed as evidence of the Dodgers placing more faith in sabermetrics, according to this article by Ken Gurnick at MLB.com. … Doubters will say his effectiveness tailed off after the second time through the lineup and only 14 of his 31 outings were quality starts. The Dodgers will counter that improvement in his strikeout stats mirror the improvement that led to his finest season of 2005. The problem I see with this analysis is that you need look no further than Ted Lilly to see its limitations. Lilly, also a lefty fly-ball pitcher, has continued to give up prodigious numbers of home runs in a Dodger uniform – 41 in 269 1/3 innings, even if he did allow none in his final six starts in 2011. Lilly’s adjusted ERA with Chicago was 122 in 3 1/2 seasons and 115 before he was traded to the Dodgers in mid-2010. With the Dodgers, it has been 98, including 94 last year. Lilly is 36 now, and unlike with Hiroki Kuroda, you can basically say the aging process is showing and that Dodger Stadium isn’t capable of stopping it. Capuano is 33, which, coincidentally, is the age Lilly was when he unexpectedly had by far the best season of his career in adjusted ERA, 144. 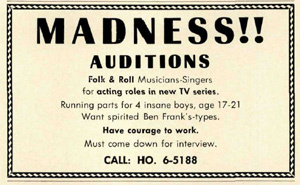 But unless you believe that 33 is a magic age, this may not work out well. Yes, Capuano has been recovering from surgery and struck out 168 in 186 innings for the Mets last year – that does seem significant. But his adjusted ERA was 82, and in his entire career it has never been higher than 113. When he’s not striking out guys, he’s getting hit – hard. And it was only getting worse in 2011: In the second half of the season, he struck out 81 in 83 1/3 innings … with 14 homers allowed and a 5.08 ERA. And what’s supposed to happen on the road, where Capuano pitches half his games, where he had a 5.42 ERA and allowed 17 homers in 84 2/3 innings? That’s a homer inside of every five innings. At $10 million guaranteed over two years, do the stats really show that the Dodgers have gotten a good deal? Sure, Capuano should pitch better in Dodger Stadium than elsewhere – but he needs to pitch better, because – guess what – the guy in the other uniform is going to pitch better, too. And that’s against a Dodger offense that, shall we say, could be challenged. That’s what I’m afraid the Dodgers haven’t taken into account. Dodger fans will certainly hope for the best, and as a No. 5 starter expectations should be kept in check anyway, but if he’s still deserving of a spot in the starting rotation by July, that might be a surprise. Because of his strikeout reputation, I got curious to see how Dodger prospect Kyle Russell compared to the swingingest Dodger prospect of a previous generation, Billy Ashley. They’re significantly different players in other ways, but I figured on an idle Friday I might just take a look. Last year, at age 25, Russell had a .343 on-base percentage, .488 slugging percentage, 23 homers, 53 walks and 144 strikeouts in 493 plate appearances, spent mostly at Double-A. Ashley spent his age-25 year in the majors as a part-time player, with a .320 on-base percentage, .372 slugging, eight homers, 25 walks and 88 strikeouts in 244 plate appearances. The following year, Ashley had nine homers and an .813 OPS in only 113 plate appearances. The 6-foot-7 Ashley graduated from Double-A by age 22 after (or despite) having more homers than walks for San Antonio in 1992. He went .317/.534, 24 homers, 16 walks and 111 strikeouts in 404 plate appearances. Those are some extreme numbers, but it’s safe to assume that he’d have been a whole lot better in Double-A at age 25. Howard Cole of the Register’s Dodgers Blog doesn’t want Matt Kemp or his fans to get too wrapped up in all this 50-50 talk. Ryan Braun won the appeal of his drug suspension. I’ll let the reaction of Hardball Talk’s Craig Calcaterra stand in for mine. In almost all cases, the people who say that someone “got off on a technicality” or took advantage of a “loophole” really mean “I think the SOB was guilty and because of that I don’t care if the proper safeguards and protocols were followed!” It’s a ridiculous stance. There’s more in Calcaterra’s post, one I urge you to read in its entirety. Between this chain-of-custody failure and the missing staple that was key to the McCourt divorce case, baseball appears to be ripping off Law and Order plot devices. I’d like to think this will end the talk that there should be a re-vote of the National League Most Valuable Player award, but perhaps that’s still too optimistic. Jerry Sands provided a lot of good copy for Dodger beat writers today, as these stories from Eric Stephen of True Blue L.A and Tony Jackson of ESPNLosAngeles.com show. … Sands got married on November 19, then spent a month in the Dominican Republic, hitting .250/.325/.375 in 20 games with the Tigres de Licey in winter league ball, where he was teammates with 40-year old former Dodgers pitcher and water cooler destroyer Carlos Perez. The Dodgers had a few roster moves today. They claimed 26-year-old outfielder Matt Angle off waivers from Baltimore. Angle had a .599 OPS in 95 plate appearances for the Orioles in 2011 and a .692 OPS in Triple-A, his skills mainly being incredible basestealing ability (38 for 42 at the two levels combined) and defense. Mike Petriello of Mike Scioscia’s Tragic Illness has more on Angle, who is on the 40-man roster but will begin the season in the minors. Rubby De La Rosa was placed on the 60-day disabled list to make room for Angle. The 26-year-old allowed five runs on 12 baserunners in 6 1/3 innings for Pittsburgh last year and has a career 5.28 ERA in 46 MLB innings. However, he did strike out 50 in 44 innings for Triple-A Indianapolis in his first significant action since recovering from late-2009 shoulder surgery. So he sounds qualified for an Albuquerque stint. Arizona offered Hiroki Kuroda $13 million for 2012, $3 million more than the contract he signed with the Yankees, according to Jon Heyman of CBSSports.com. Ernest Reyes of Blue Heaven posted a bevy of vintage Dodger photos available at Legendary Auctions. EAS Sports Nutrition has a contest that will provide the winner and a friend airfare to Phoenix, hotel, rental car and tickets for two Spring Training games over the March 16-18 weekend.